Plastic bottle caps are perfectly sized for little hands and can be used for so many things. 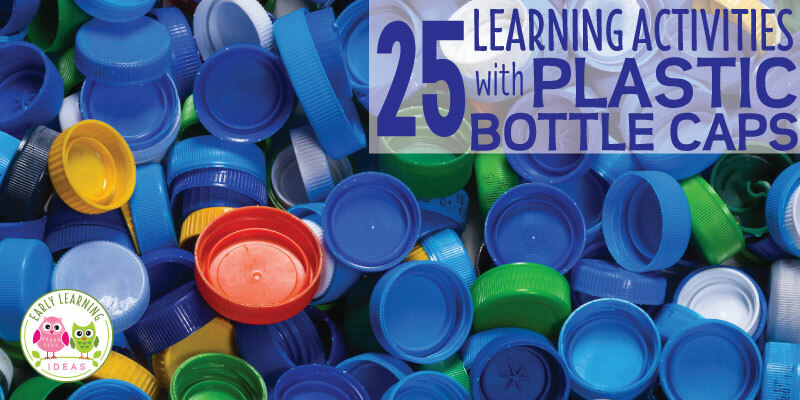 Here are 25 ways to use plastic bottle caps for learning activities with kids. Oh, the things you can do with a plastic bottle cap. Do you save plastic bottle caps and lids? 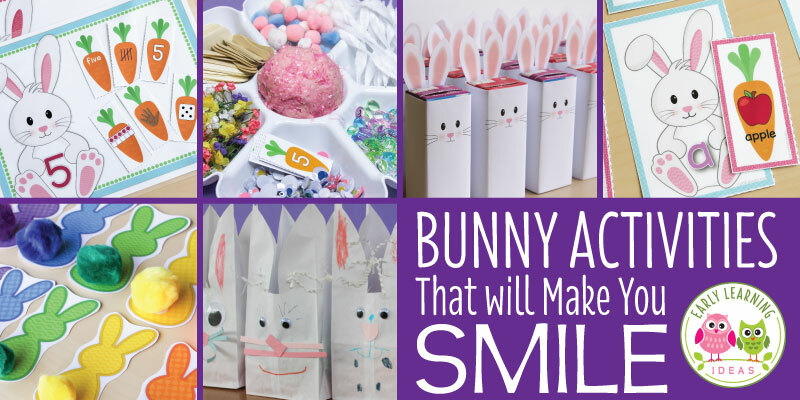 They are perfectly sized for little hands and can be used in oh so many ways. Here is a list of many ways to use these little round resources for learning. Disclaimer: WARNING – bottle caps can present a choking hazard. Small parts are not for children under 3 years. 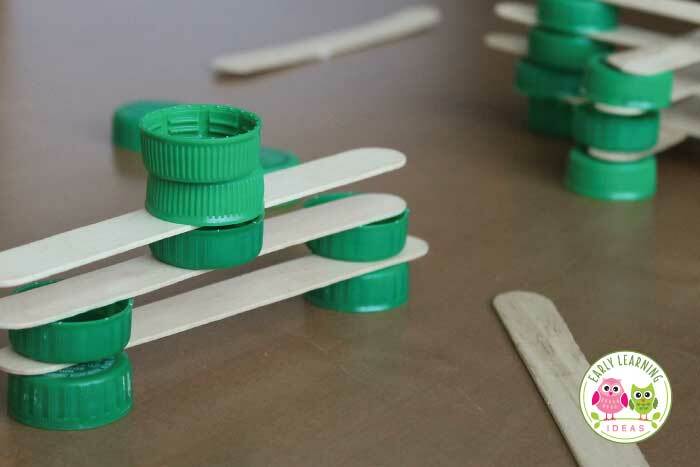 Use plastic bottle caps along with craft sticks for building. This requires a steady hand and a little bit of patience and is a great fine motor activity. Add a basket of plastic lids to your block center. How do your kids use them in their block creations? A sensory bin can be filled with bottle caps or bottle caps can be added to a sensory bin filled with another material. Kids can find matching lids, matching colors or the lids can make great little containers for a sensory bin filled with rice, sand, beans, or corn. Kids can make little boats with the lids for a sensory bin filled with water. Bottle caps would also be a great addition to the sandbox. A bunch of bottle caps can be used with toy dump trucks, tractors, wagons, front-end loaders etc. 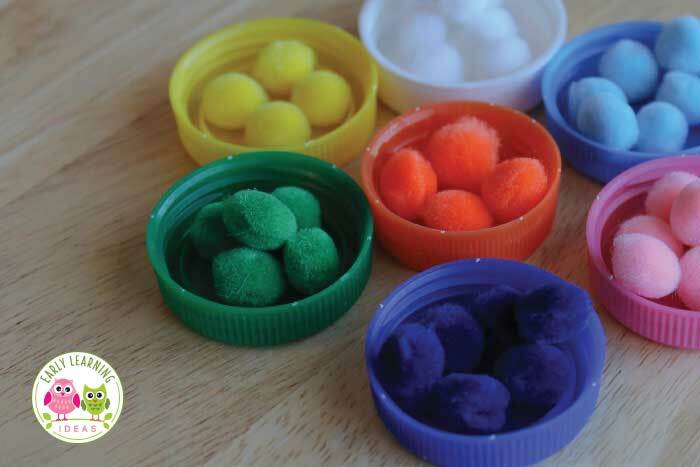 Color code containers and ask kids to sort lids into the appropriate colored containers or place colored puffballs into upside-down lids. Add a pair of tongs with large puffballs or a pair of tweezers with small puffballs for another great fine motor exercise. Add bottle caps to art boxes or trays, or tinker trays. Kids can add them to their works of art. Sort all of the lids by size. Can they be nested? Can they be stacked by size? How tall is the stack? How many can be nested together? Write letters on the lids. Kids can match lowercase to lowercase letters, uppercase to uppercase letters, or lowercase to uppercase letters. Want to see an example? Check out this post from Crayons and Freckles. 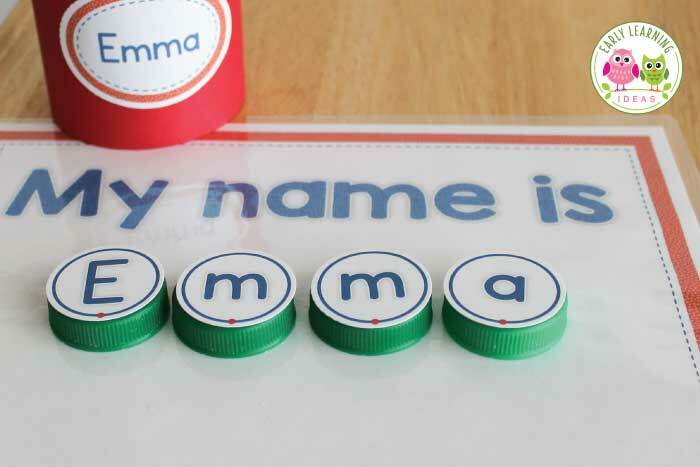 Write letters on lids with Sharpies and use them on letter sorting mats instead of magnetic letters. Hot glue a cork to the bottom or back of a bottle cap so that you can use it for stamping or printing. You can also add foam stickers to the top of the caps to make interesting stamps. Write letters or use printable letters to add to the top of plastic lids. Use these name puzzles to help kids learn how to spell and recognize their names. Write letters on the tops of bottle caps and kids can practice spelling word families or sight words. Write the complete words on the bottle caps and kids can sort by word family, beginning letter, ending letter, etc. Add lids to a play dough station. The lids might make great wheels, eyes, spots. 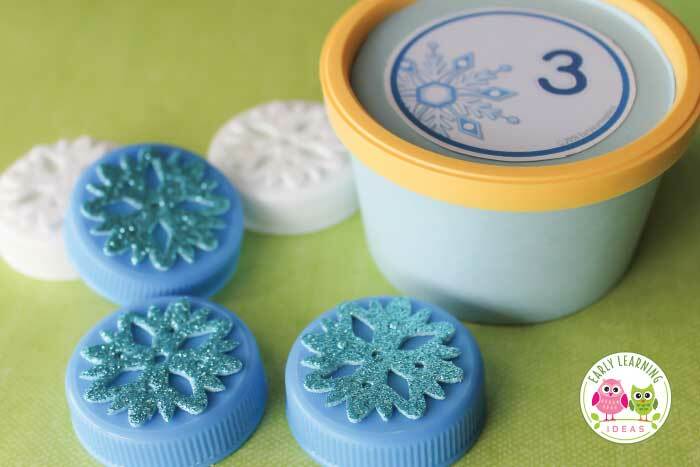 They also make a great circle cutter and can be used to create cool textures on the play dough. 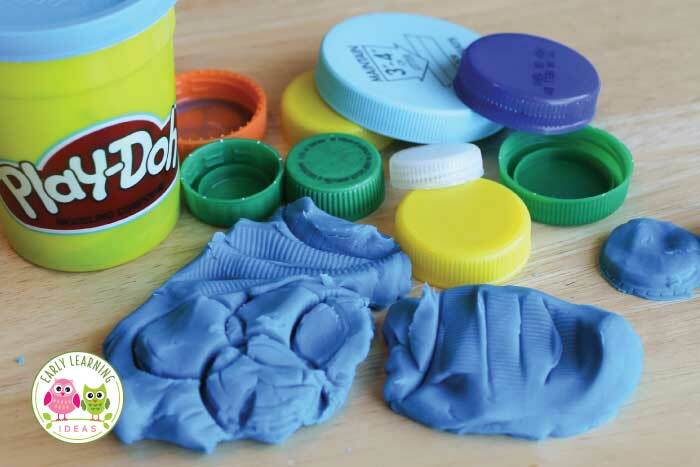 Kids can also use playdough to help hold stacks of lids together. How did they use them to enhance their creations? Use an eyedropper to ad water to a bottle cap. Can you fill it past the top? 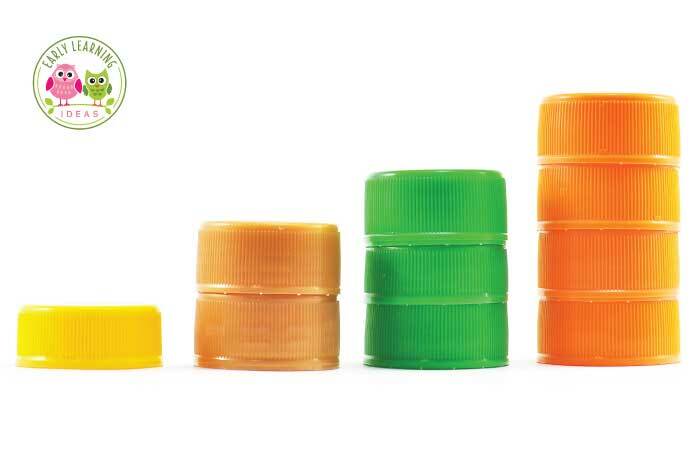 Use the bottle caps as a non-standard unit of measure. How many bottle caps long is the book, the bookshelf, the pillow, my foot, my friend Joe? Need just a little bit of paint for Q-tip painting? Need a little dab of glue for a project A bottle cap makes a great little paint or glue container. How many lids can you stack? Is it easier if they are different sizes or the same size? An empty Parmesan cheese container or a wipe container along with a bunch of lids can make a great fine motor activity for a child. Add a pair of tongs or plastic tweezers and so that kids can grab the bottle caps with a tool. Use the lids as patterns to draw circles. A basket of bottle caps can provide an opportunity to practice patterns. If you are studying caterpillars, kids can make patterned caterpillars. Work on letter recognition and formation by using bottle caps to trace large letters. Small bells, rice, beans or seeds can be placed inside two lids. Colorful duct tape will hold the lids together and the filling inside. Here is a tutorial by Buggy and Buddy. 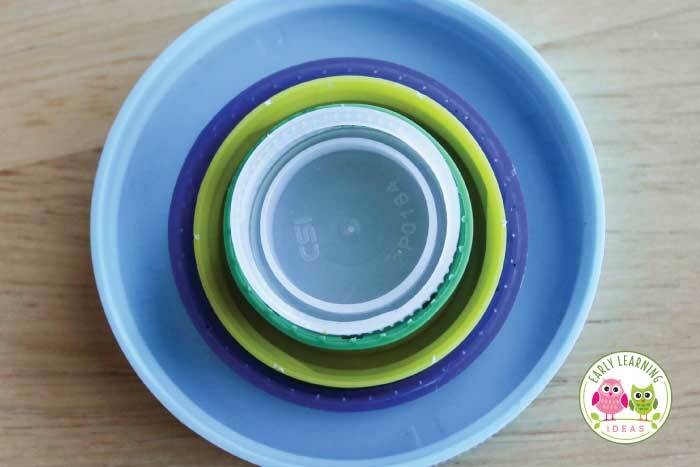 Use plastic lids as counters for counting activities. You can always add stickers or pictures to the tops of the lids to compliment a theme or the interests of children. 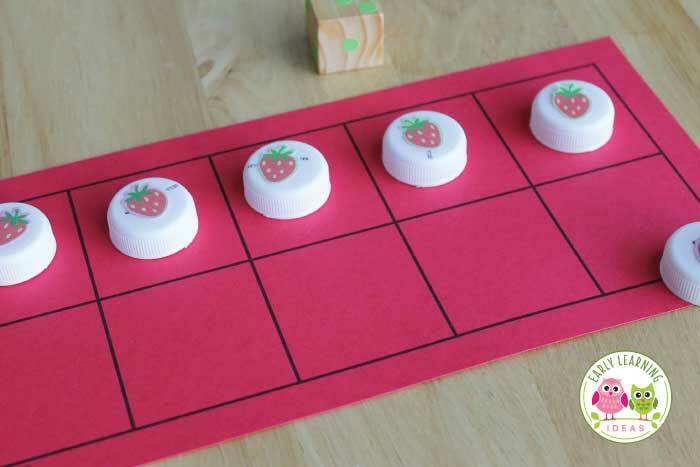 Bottle caps also make great counters when using ten frames for one-to-one correspondence practice. Need some counters for a math game? Plastic bottle caps fit the bill. Add stickers to create a thematic game. I’m sure there are about a million more ways to use plastic bottle caps. Have a great idea? I would love to hear it – please share in the comments below. Some of the resources pictured in this article are available in my TPT store. Click on the images below to check them out. I had an inspiration one day in my ESL classes for kds, for listening practice and reinforcing the names of colours. I would place 8 bottle caps of different colours in front of each team, and then call out four colours in quick succession, eg. “yellow pink black green” and the kids would have to choose those colours and place them in a line in the exact same sequence… The teams would race to be the first to get the right colours in the right sequence. Excellent listening practice and the kids liked it so much, they begged me to play it every lesson after that! I have collected all shapes, sizes, and colors and am going to make a giant box with various sized openings so the kids can find the right size for their lid to fit into! Sort of like a large mailbox for lids! I actually didn’t paint any of the bottle caps. I just collected a bunch of different colors. What kind of paint do you use to paint the bottle caps? I bought spray paint for plastic and it scratches off.